Bellatrix, I'm a Pug! : Mommy's Home! I had so much Daddy Time that I slept most of the day away. Over the last few days, me and my Daddy went to the doggie park, went on walks, went to the doggie wash place, and on Saturday, we went to Point Isabel! I had a lot of fun and got to play with all sorts of doggies! Now that my Mum is home, I can smile and have all my hoomans back! Bella! YEAH! It's always great to have both 'rents home. Love the picture of you today! Bellatrix! Whatta SMILE! I can tell you are so happy to have your Momma back! That is how I felt when the 'rents returned from MMouseland. That is the reason for my DREAM! 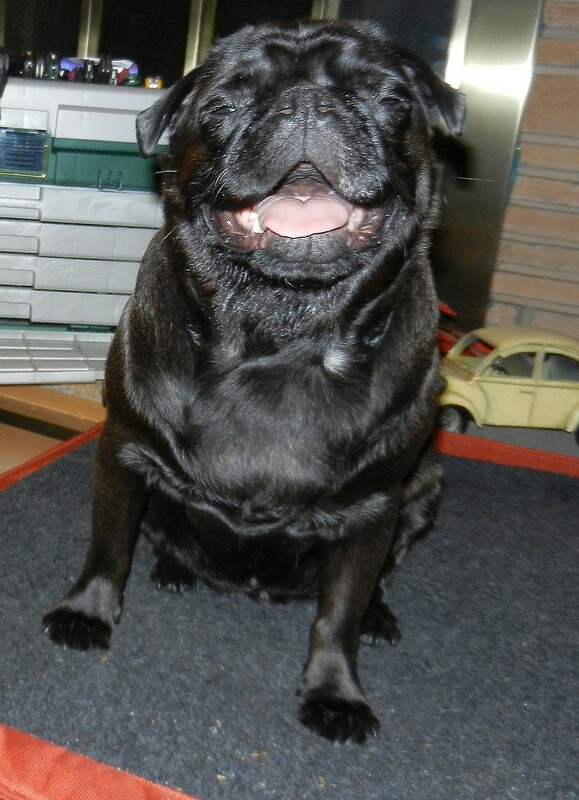 oh that is the cutest pug smile we have ever seen! we can tell how happy you are to see your mom. we thinks you might just love her a little bit! I love that smiley face! That is a classic Bellatrix! You look soooooo happy. I love it! What a happy girl! So glad to hear your Mommy's home and that she had fun. We do not know if we could handle being without our human that long. We cry like we're being tortured everyday when she leaves for school and that's only for a couple of hours. You are lucky to have a Daddy to spoil you when Mommy's not around. You look so happy :) It's great to have all your humans around!